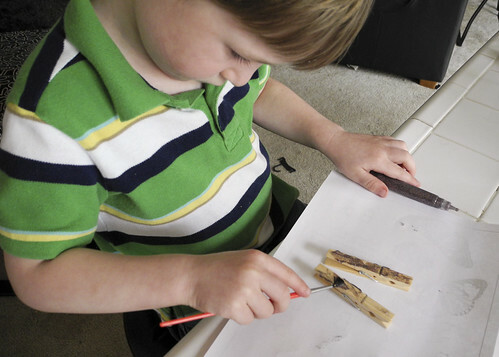 I found this fun activity at Family Fun and it was so much fun I had to share. This is another way to get your kids to “cook”. We made our caterpillars first. I was actually very proud of Zane because he was the one to point out that the caterpillar turns into a butterfly. We painted the clothes pins ($ Tree is a great place for these) with glitter glue. We used a brush to spread all over the clothes pins. Then we added googley eyes and pipe cleaner antenna. That made us caterpillars! 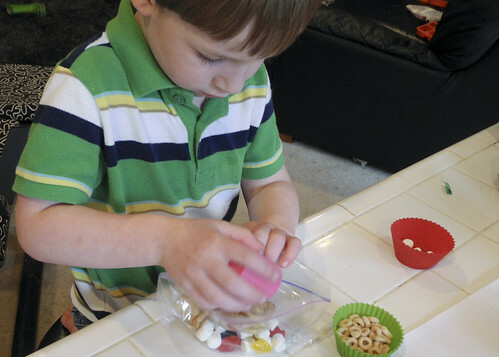 We then made the snack mix in snack bags. 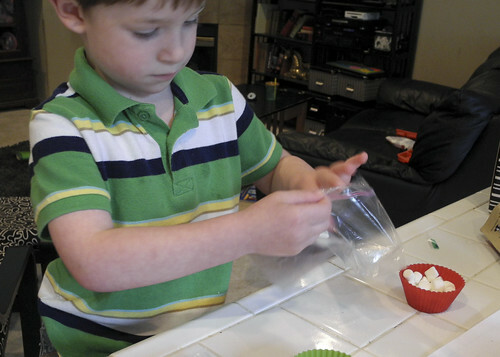 I put different ingredient options for Zane to add to the bags. Pretty much everything got dumped in, but you could take your time with your preschooler and have them plan out their snack mix. 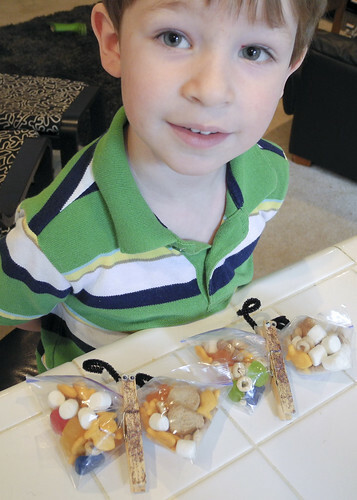 Zane was very proud of his Butterfly Snacks. I thought his butterflies turned out great and we may make them again for a treat for a play date or to brighten a friends day. What’s also nice is if you use good glue to glue things down you can just reuse the caterpillar part of the butterfly over and over. Could you see yourself doing this with your kids? I think my son made those in school once. I don’t really remember since he destroys every thing he makes as soon as he gets home 😛 But they look cute. Good job! Pepper, these are amazing! In fact, I think I might do those for my youngest’s birthday party this weekend! I know both he and my older son will get a huge kick out of these!